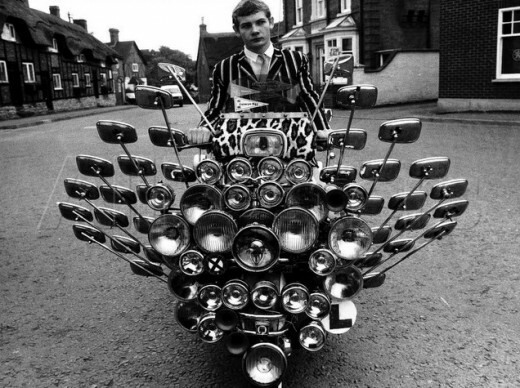 After a law was passed requiring at least one mirror be attached to every motorcycle, mods were known to add four, ten, or as many as 30 mirrors to their scooters. One of the biggest scooter story from EICMA last autumn was the debut of Vespa’s new Primavera. Replacing the well-loved LX-150, the Primavera not only takes over in terms of Vespa’s small-frame offering, it’s the first new Vespa design in quite some time. More specifically, it’s the first “regular” Vespa model since the debut of the 946. That post-946 distinction is important because when we look at the Primavera, its 946 lineage is obvious. Where the 946’s limited production numbers and aspirational price point put it well out of the reach for most scooter shoppers, the Primavera is the “new” small frame Vespa for the rest of us.